The law allows individuals or couples to request either chapter 7 or chapter 13 bankruptcy protection. In the former, unsecured debts are discharged and property that is not exempt is seized for the repayment of secured creditors. In chapter 13, the court sets a repayment schedule so that the debtors can pay back a percentage of the debts to all creditors. The marital settlement agreement that finalizes the divorce must set out the future obligation of each spouse in a chapter 13 proceeding. If you file bankruptcy before the divorce is final, you remain married for the purposes of the bankruptcy case. The bankruptcy protects community property – anything you bought during the marriage -- from seizure by unsecured creditors, which includes credit-card companies and personal lenders that did not secure their loans with your property. Whether you file bankruptcy as an individual or as a couple, the bankruptcy estate includes all community property listed on the bankruptcy petition. If you are separated, and your spouse unexpectedly files for bankruptcy protection, you must find out if an individual debt was listed as community property. Community property states consider both spouses responsible for all debts contracted by either spouse during the marriage including such individual debts as student loans. These states include Alaska, Arizona, California, Louisiana, Idaho, Nevada, New Mexico, Texas, Washington and Wisconsin. The other states consider debts contracted by an individual as that individual's sole responsibility, even if the individual is married. However, if a spouse cosigns a private student loan for her spouse, she can still be held responsible for that loan. If you file bankruptcy during a divorce, you cannot discharge any child support or alimony amounts set by the divorce court when your divorce becomes final. The bankruptcy does not prevent a family court from ordering support payments. Those amounts will remain obligations of the spouse ordered to pay the support. Nor can you discharge student loans or federal and state taxes. Any federally guaranteed student loans as well as tax obligations remain outstanding and subject to collection efforts by the government. Any property exempt from seizure in a bankruptcy proceeding will be divided between the spouses by the divorce court; the division of assets will be set out in the marital settlement agreement. Exempt property includes a vehicle, first home and some personal property such as clothes and wedding rings. State laws vary on what property can be protected in this way; second homes, for example, are exempt in some states and not in others. If the marital settlement agreement includes debts, those debts must be handled according to the agreement. In general, they cannot be transferred to the bankruptcy and discharged, whether or not they are secured. It’s important to file and resolve the bankruptcy before the court finalizes the marital settlement agreement. 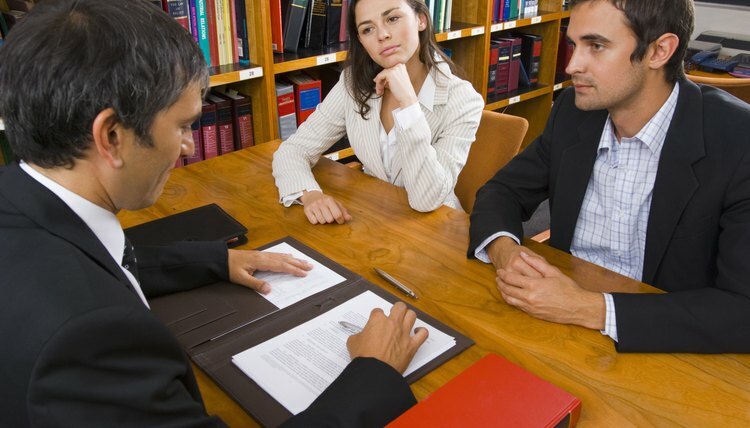 If you are considering bankruptcy during a divorce, you should try to agree on a division of property to repay any secured debts in a chapter 7 bankruptcy; otherwise, both the divorce and the bankruptcy will be subject to litigation, greatly increasing your costs and the amount of time it takes to get a resolution of both matters. Divorce.com: Should You File For Bankruptcy During Divorce? FoxBusiness.com: Is Wife Liable for Husband's Student Loans?